Home BUSINESS Thika Tuk-tuk operators launch mobile App to similar to Uber, taxify. Thika Tuk-tuk operators launch mobile App to similar to Uber, taxify. Tuk-tuk operators in Thika have launched a mobile taxi application in a bid to offer a reliable, instant and truly fast service to their customers. Speaking exclusively to Thika Town Today on Wednesday, the Chairman Thika tuk-tuk Supreme Organisation Mr. Raphael Karanja Mwagu said that their main focus is to provide efficient transport service to people. He said that they came up with the idea after realising the challenges faced by most of their clients when they couldn’t get a tuk-tuk or get a driver's attention. 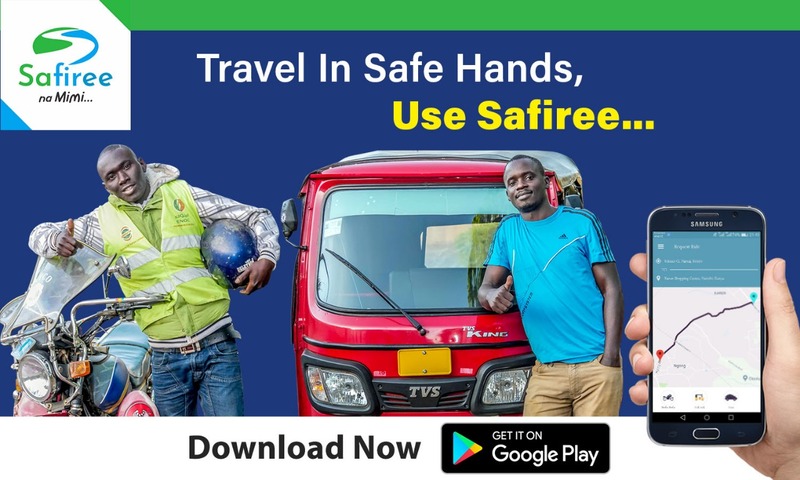 The “Safiree App” is intended to fill the gaps of an informal transport system that make tuk-tuks hard to find for customers in quiet neighborhoods, or leave drivers and clients sparring over the price of a trip. According to the chairman, it will help take a lot of inconveniences like this out of the traditional ways of taking a hiring an auto rickshaw or tuk-tuk for a short ride which at times led to an exasperating argument over the price. “Anyone with a smartphone can download the application for free and use it to get a tuk-tuk anywhere within Thika town and its environs. All it takes is a tap of your finger, and within a few seconds, you can locate the nearest tuk-tuk rider to you and the App will give you the amount you need to pay to your preferred destination,” explained Karanja. Karanja added that since the system is connected to their main server, the management is able to track the operations of each and every operator, in case of any challenges or complaints. “This App will help us to follow up on individual operators and in case any one of them is in trouble or if a customer has a complaint against any operator, we will be in a better position to chip in with a tangible solution. This way, we will be able to minimise cases of insecurity among the tuk-tuks,” he said. So far, since its activation this week, about a hundred tuk-tuk operators have already installed the App and are ready to offer their services to anyone who requests for them via the App. The chairman says that they intend to have activated almost 90% of their members into the system within the next two weeks. The organisation, which incorporates all the tuk-tuk association within Thika East and West sub-counties has a membership of 604 operators. At the moment, the operations of this system is in cash or as in whichever way both the client and the rider will agree. However, Karanja reckons that plans are underway to install a mobile money payment system where clients can pay via M-PESA or any other electronic mode of payment. Karanja says that in future, they plan also to incorporate bodaboda riders so as to help regularise the town’s transport system.